SYNOPSIS: "Happy Holidays" is not as inclusive as many thought it to be. "Merry Christmas" is not as critical as some may think. Living in the West, one of the peculiar happenings during Christmas is the ongoing debate whether to use "Happy Holidays" or "Merry Christmas." In secularized North America, many are afraid, even outraged over allowing the use of the word "Christmas" in the office, at government buildings, outside shopping centers, various community centers, public gathering places, and various workplaces. They say that we live in a secular city, so all references to anything religions must be done away. They are angry whenever corporations or government offices use the word "Christmas" on their properties. In order to appease the atheists, the secularists, the non-religious, in a largely secular society, public organizations and schools ink the words "Happy Holidays" across all their year end celebrations. Of course, some churches accepted that as a reality of living in a secular culture. Others are up in arms against the way materialism, humanism, and secularism, are steamrolling their atheistic agenda on all things Christianity. Four years ago, I wrote on this same issue, and argued two main points. The first is that the use of Christmas is important from a historical and traditional standpoint. The second is that those who dogmatically insist on "Happy Holidays" as a preferred substitute for Christmas are becoming the very people they themselves are trying to avoid: Being religious about it. Of course, we are not talking about religions per se. Christians can sometimes label secularism as a religion in itself. Of course, the secularists will deny it, saying they have no god, or they do not believe in any god, as the reason why they are not a religion. That is not the point. The point is religiosity. It is religiosity that has often put off many people. Whether it is the "hypocrisy" or the "bigot" label, as long as one is human, one can practice anything religiously. Let me make two additional points. A) Is the Greeting "Happy Holidays" Really All-Encompassing? The first point is about inclusiveness. Is the greeting "Happy Holidays" really all-encompassing? Anyone who tries to shove this down the throats of Christians will need to rethink what freedom of belief means. Just because they think it is suitable does not mean all Christians have to treat them acceptable. After all, it is a season that is meaningful for Christians, just like Hanukkah is to Jews. Otherwise, for all the accusations of Christians being bigots, are they sure such non-Christian advocates are lesser bigots? For all the accusations of Church-goers being hypocrites, are they certain these secularists are lesser hypocrites? Truth is, we are all sinners. We are all bigots in some ways and hypocrites in other ways. People who say they are absolutely not are deceiving themselves. This is manifested through our tendency to go to the other extreme, that in the process of trying to correct something, we tend to over-correct and over-react. The example of the district judge throwing out a Christmas tree in an Ontario courtroom is a classic example. Good tree. Poor label. So out it goes. The whole over-correction episode has crossed the line of decency toward absurdity. What has Christmas to do with a tree? How does one word "Christmas" offend secularist minds? Is Canada or the USA only for secularists? Is it not true that all are allowed to practice their religions freely? Is the greeting "Happy Holidays" really all-encompassing? I think not. If we really want to be all-encompassing with our holiday greetings, "Happy Holidays" do NOT go far enough. Christians in North America are no less American or Canadian than non-Christians. The country, the government, the public places must be open to all. KEY: The words "Happy Holidays" are not inclusive enough. My second point is this. Do to others what you want others to do to you. In trying to replace "Jesus" and "Christmas" with "Santa" and "Happy Holidays," how will secularists feel if we replace "Santa" words and symbols with "Jesus" words and symbols; or "Happy Holidays" with "Merry Christmas?" They don't like it of course. Then why force such labels on Christians? If Jesus and Christmas is offensive to them, are they aware that Santa Claus is in some way rather insensitive to many pious believers? Santa Claus is a symbol of materialism that irks some Christians. Is the secularist going to be sensitive about that? "Happy Holidays" take away the religious significance that is meaningful for Christians. Is the public that is dedicated to liberty sensitive to that? Just last week, I heard of someone who just returned from a Bible Belt state in the US, saying how she met a resident who had never heard of Jesus Christ as the reason for Christmas. To that person, Christmas is that all-encompassing word that houses Santas, reindeers, snowflakes, carols, Charlie Brown or Chipmunk Christmas, trees, lights, turkeys, and all those pretty decorations around the Christmas tree. Except Jesus. That is a sign of secularism gaining increasing mindshare in secular societies. 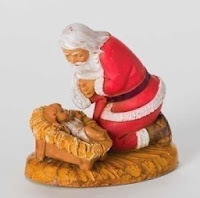 Over time, the next generation will increasingly think of Christmas as Santa Claus, and less about the actual origins of Christmas in Jesus Christ. In addressing the all-encompassing question, if retailers, public figures, and community groups want to be all-encompassing, they cannot just use either "Happy Holidays" or "Merry Christmas." They need to adopt both. If feminists are offended with sexual discrimination, or people disgusted with racial discrimination, why do public places discriminate against a large group of Christians by forcing a "Happy Holidays" on an occasion that carries so much religious significance for them? Take public statements for example. Patriarchal words are now increasingly being replaced by "men and women," "boys and girls," "male and female," and so on. Why not "Merry Christmas" AND "Happy Holidays?" Surely, both can co-exist? I know that many comfortably wish the Jews "Happy Hannukah." They wish the Sikhs, "Happy Diwali." They wish the Chinese "Kong Hee Fatt Choy." For the Malays, they wish them "Hari Raya." Yet, when it comes to Christians, they prefer to utter "Happy Holidays" instead of the traditional Christmas greetings. I wonder why the sharp discrepancy. Personally, I do not have a problem when people use "Happy Holidays" or "Merry Christmas" interchangeably. However, to explicitly deny the use of "Christmas" altogether is another thing altogether. It shows an unequal level playing field that is strangely targeted at Christianity. Now, let me get to my main purpose for writing this article. After establishing some ground for an all-encompassing use of both Christmas and holiday greetings, I want to urge Christians in particular not to get too caught up in the debate. It is one thing to win an argument. It is yet another to win over a person. Even if Christians eventually win over the right to use "Merry Christmas" during the busy Christmas season, what good will that bring to the gospel? What kind of testimony will it bear? Is the phrase "Merry Christmas" able to turn more people to Jesus? Will explicit Christmas greetings do the Church more good? Definitely not. Yes, Christmas is about Christ. Yes, Jesus is the reason for the season. Yes, Merry Christmas is in line with the meaning of December 25th. 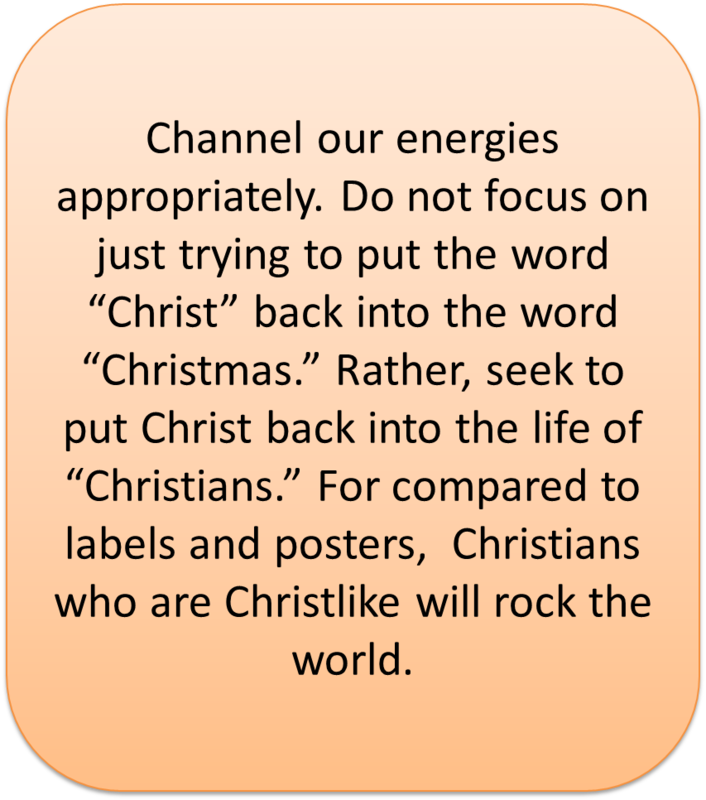 The point is, Christians are not just Christians over the month of December. They are believers 24 hours a day, 7 days a week, and 365 days a year. They are to be Christlike at all times, in all places, and during all occasions. Channel our energies appropriately. 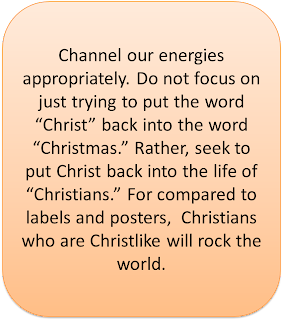 Do not focus on just trying to put the word “Christ” back into the word “Christmas.” Rather, seek to put Christ back into the life of “Christians.” For compared to labels and posters, Christians who are Christlike will rock the world. The words out there are less important than the Word in us. Speaking for Jesus must stem from a life that is already full of Jesus. It is more important to be like Christ than to win over arguments about Christ. Yes, Christians will live peaceably. The symbol of Santa is not peace but gifts of materialism, fodder for consumerism, amid a culture of individualism. "Happy Holidays" are meaningless words equated to shallow greeting words like "How are you today?" Jesus is not simply the reason for the season. He is the Prince of Peace. He is the Mighty God. He is the Son of God. Santa Claus is paraded mainly on the month or so prior to Christmas. Jesus Christ can be shared all twelve months of the year. 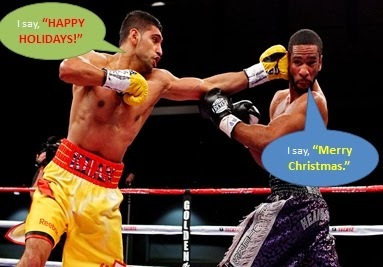 My readers, do not be too competitive about the Merry Christmas vs Happy Holidays debate. We have a more important task: Be Christlike everyday, everywhere, and every time. From Sabbath Walk, here is my greetings for all of you.